Aliens vs. 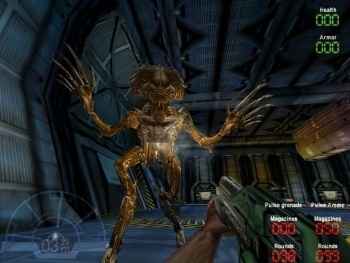 Predator Classic 2000, an update of Rebellion's acclaimed 2000 shooter Aliens vs. Predator Gold, is now available on Steam. The new update of AvP Gold, which was itself an update of the original Aliens vs. Predator released by Rebellion in 1999, gives players a chance to get down with some old-time xenomorph hunting action while they wait for Rebellion's newest game, the ever-so-creatively titled Aliens vs. Predator. Maybe nobody's scoring any points for originality here, but in its day Aliens vs. Predator Gold was one of the best shooters on the market and it remains a high-water mark for fans of the franchise. AvP Classic 2000 features all three campaigns from the game (Alien, Predator and Colonial Marine) and all the levels from the original release plus the Millennium Expansion Pack. Multiplayer is not currently supported but will be added in a free patch, while the Skirmish mode against endless Alien hordes is included. The game has been updated to run on current hardware using DirectX 9.0c and offers support for Xbox 360 controllers in Windows, but "current hardware" hardly seems necessary; the game requires a minimum of a Pentium II 400 MMX, 128 meg of RAM and 500 meg of hard drive space. So if you've got five bucks to spare and an urge to get in touch with your inner Hudson, head over to Steam and hook yourself up. For those in the mood for something a little more up-to-date, Rebellion's new Aliens vs. Predator hits the shelves on February 16.